Hello. It’s Saturday. It’s the Interlull. I saw a tiny bit of international football on Twitter last night. Not on purpose, I should add, it just popped up but it had an Arsenal flavour. France were playing Colombia and they crossed from the left hand side, low and to the near post. It should have been easy for the Colombian goalkeeper but instead the ball ricocheted off his wrists and into the path of a very handsome striker who swivelled and fired the ball into the roof of the net. Olivier Giroud was that striker, taking advantage of a mistake by David Ospina and at first I was all ‘Ahh, Ospina, that fella’s a gas lad altogether’, but then I realised that he will be in goal when we play in the Europa League against CSKA Moscow and whoever else we face assuming we get past the Russian side and my heart felt a little bit sad. I guess it’s one of those things that is basically inescapable. I mean, it is completely escapable in that Arsene Wenger could just think to himself, ‘I might play my best goalkeeper in the one tournament that could bring success to the club this season’, but he has given his word to Ospina and that is sacrosanct. It’s like footballing Omerta or something. 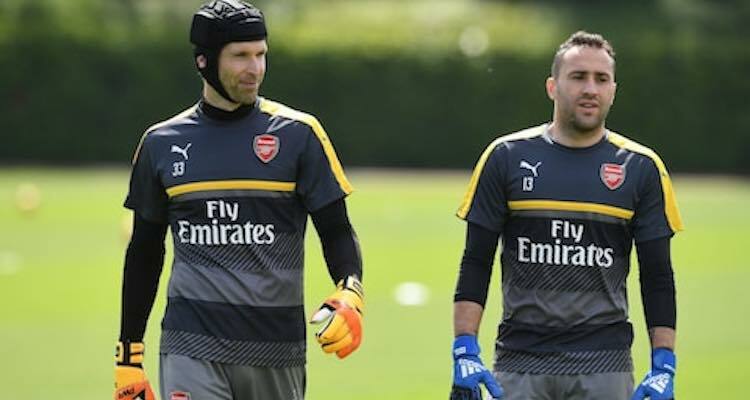 I’m not saying Ospina is a 16 stone tramp. Far from it. He seems very well presented, is often well groomed, and appears to be quite svelte and lithe. Those are not qualities typically possessed by an overweight hobo but I can’t help but be worried about the situation. “Wait!”, I hear one or two or indeed many more of you cry. “Petr Cech hasn’t exactly been Mr Reliable this season”, and I wouldn’t disagree with that in the slightest. He would be the first to admit that, and in fact he has admitted it more than once. However, my personal preference – as we head towards the business end of a European competition for the first time since reaching the semi-finals of the Champions League in 2009! – would be for Cech to be in goal. His experience, his calmness, his tallness, his possession of a neck which allows him to extend his arms, and his general presence would be more reassuring to me. I can’t say for sure if the Arsenal players would feel better with Cech in goal than Ospina, but I suspect when the margins become even more slender as the opposition increases in quality, then you should do everything you can to ensure you have the best chance of winning games, and having a keeper who has been there and done that helps. If Cech is considered better than Opsina because he’s our Premier League keeper and the league is considered the most important competition each season, then we should use him in Europe. I know, a promise is a promise, the manager’s word is his word, but his responsibility first and foremost is to his team and his club, not his relationship with a bit-part player who could well leave this summer anyway. Maybe I’m worrying for nothing. If Ospina performs well and helps us achieve success I will be delighted for us and for him, but nowhere else on the pitch is there this absurd situation where a player’s selection is pre-determined because the manager couldn’t face the idea of telling one his keepers ‘You’re the number 2, get used to it’. The bigger picture, of course, is that this summer we have to sort this out and bring in a goalkeeper who is the unquestionable number 1 and plays in all the important games he’s available for. And make no mistake, the Europa League is now very, very important for Arsenal football club. It’s a trophy, it’s a pathway into next season’s Champions League, and it means a lot – we should do everything we can to win it, and that means picking our best team for each game. Away from that, there’s a very interesting interview with Arsenal youngster Vlad Dragomir over on Arseblog News. He talks about life at the club, the coaching and instruction they receive, what he learns from watching Mesut Ozil, the current situation with the team’s under-performance and much more. Check it out here. Finally for this morning, I’ll leave you with yesterday’s Arsecast, a phone-in show with Arsenal fans from all over the world calling in to shoot the breeze. Everything you need is below, have a great Saturday, I’ll be back tomorrow.